Brett and his wife, Attea walked into Williams Studio with a folder that was jam-packed with magazine clippings, ideas, sketches, and more clippings. An entire years worth of ideas were in that poor folder. The idea was to have Williams Studio piece together their new kitchen based on that folders contents. Brett and Attea had it all figured out, and after researching every local design studio, they chose Williams. What happened next will live forever with what became known as the year that never was. 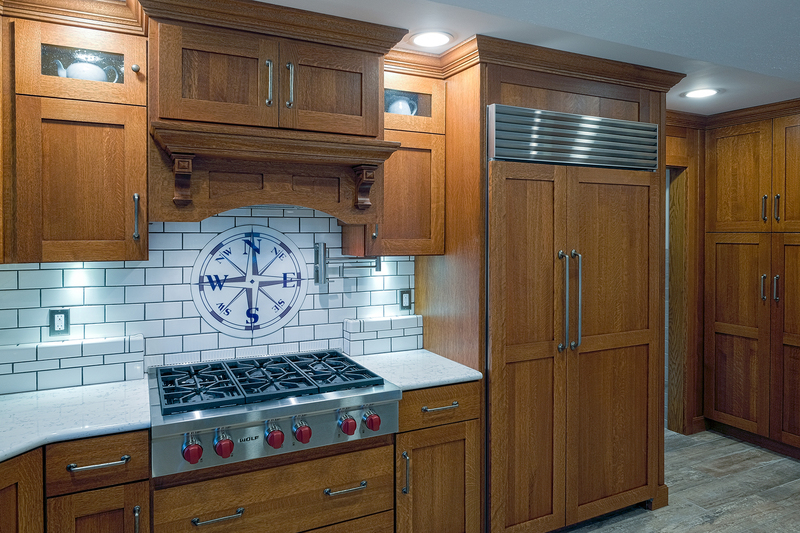 After all the work they put in, Brett and Attea pointed to a showroom kitchen and told Susan Addicott, ‘just give us that kitchen.’ The folder was tossed and the design process began. And believe me, it wasn’t as easy as it sounds. 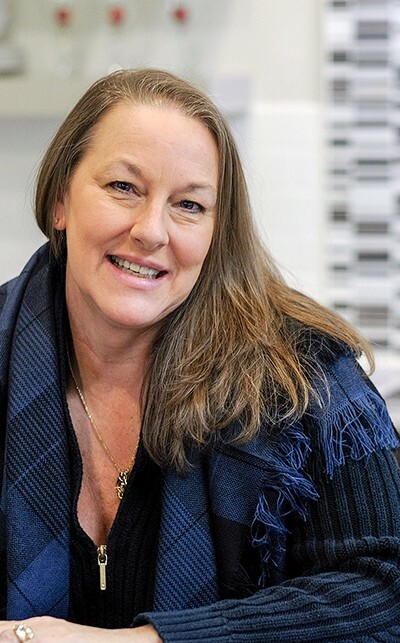 After the initial conversation with Susan, Brett knew he found his designer, one that ‘had good taste, had been around the block, and had access to the quality pieces that we were looking for.” That’s one of the major reasons Brett and Attea chose Williams — the higher end products that Williams carries. It was not just a new kitchen that Brett and Attea were looking for. Brett mentioned to Susan that he would like to hear her recommendation on a builder that can complete a laundry and bathroom build. Three bathrooms to be exact. Susan sent over her 3 best builders, and after walking through his home with each, Brett recalled the choice being very easy. Dan Rauser from NuConcepts was his man. Detail was important to Brett and Attea, and Brett knew that Dan had the eye for that detail. The point of this project was not to save money. The point was to have it done the right way, and Dan recognized this. He and Brett clicked early on, and they both now consider each other friends. 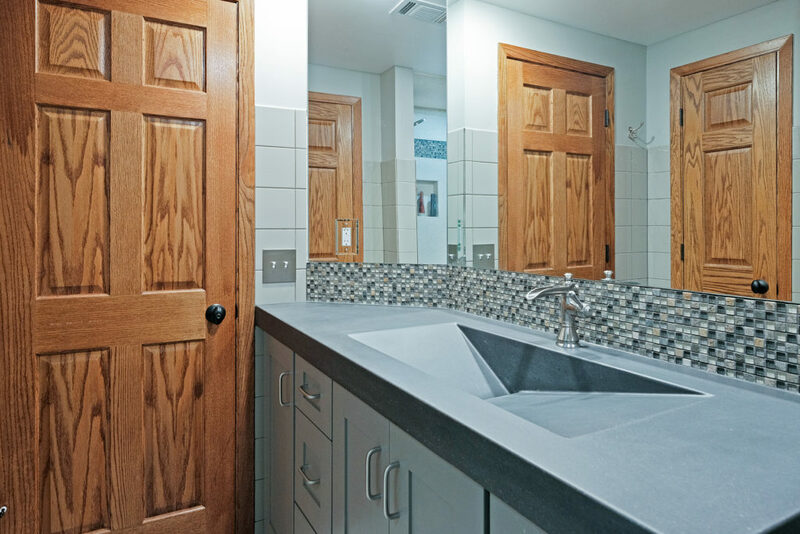 Brett had done remodels in the past, and one thing he learned from those experiences is that he wanted to work with one person for the entire process. Brett wanted one person that he could trust. He follows an old theory that birds of a feather flock together, and he knew that Susan would surround herself with trustworthy and quality contractors. Susan did not fail to deliver and Brett had his wish. 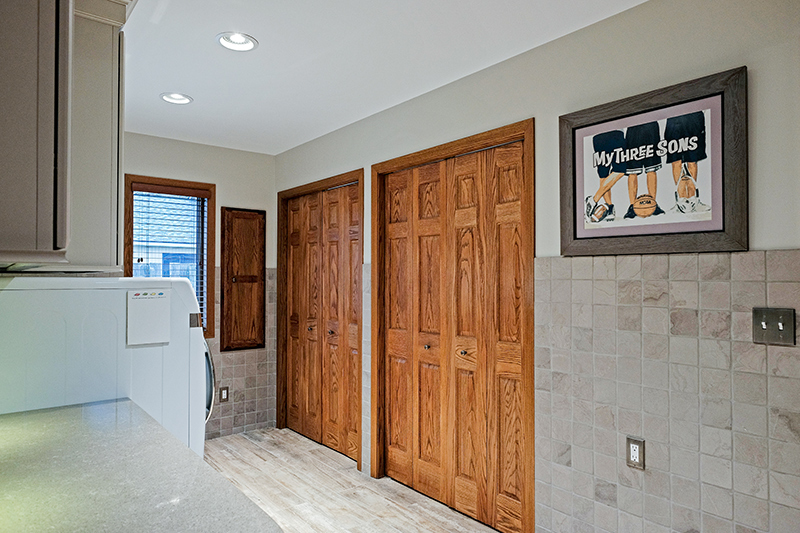 Everything from the flooring, brick layers, carpenters, to stainless steel and plumbing. 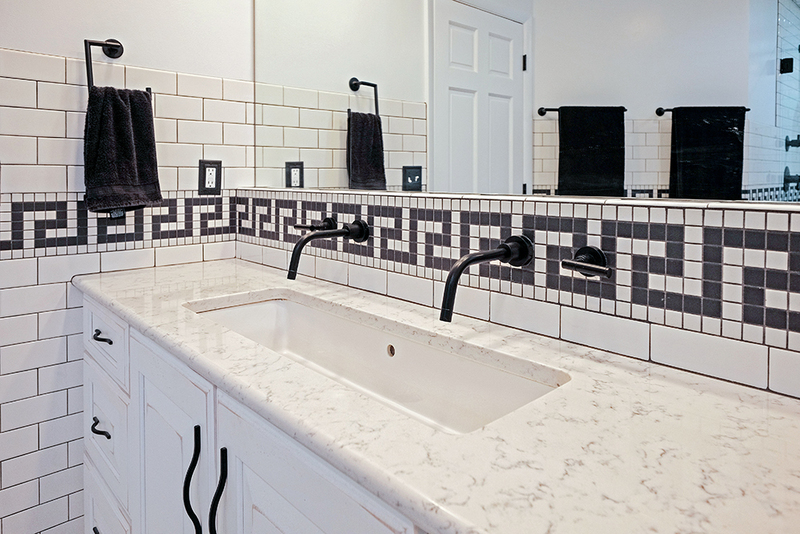 Every contractor shared the same vision and worked together like a tight-knit family. 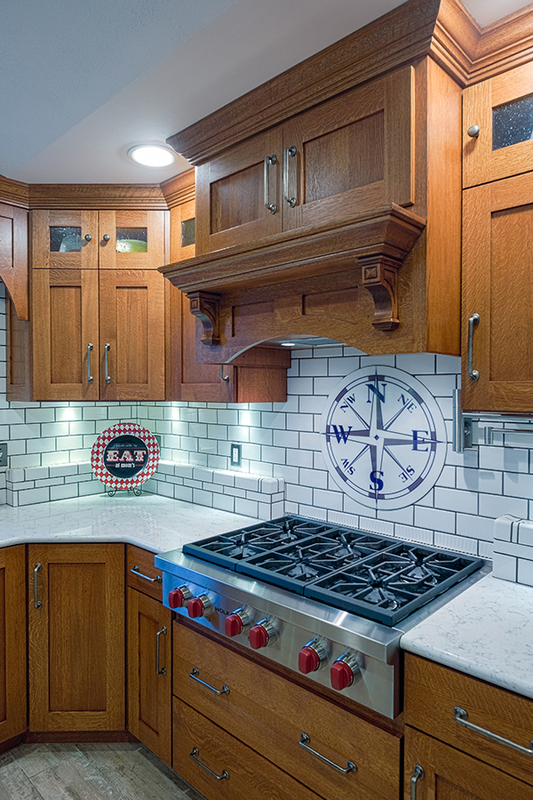 Brett is a busy man, and Susan made it very easy for him to communicate and plan this remodel. 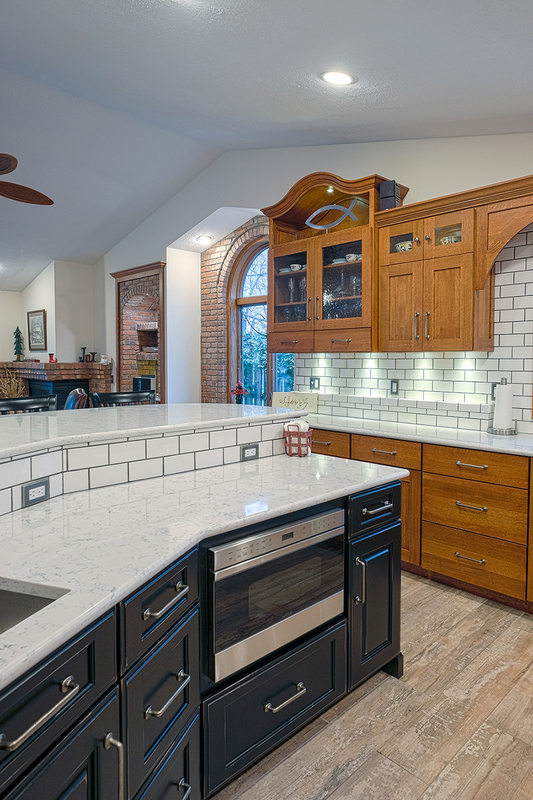 This build went from a kitchen remodel to a full-blown home makeover. Brett and Attea wanted to stay in this home forever and felt as though some of the rooms were a bit worn. They loved their location on the water, they loved their neighborhood, and they wanted to stay for the long haul. It was important to Brett and Attea that the rest of the house belonged to the kitchen, so they began to look at each and every room and make changes. Susan was there for Brett every step, but this was Brett’s plan. He had a vision of exactly what he wanted his ‘new’ home to look like, and Susan says that he was very good at communicating his ideas. There were times when Susan told Brett, “I don’t get where you are going with this, but I’m hopping on the train with you”. After Susan, Brett, and Attea discussed and created the design, they headed to Dan for his input. It’s at this point where many home owners and designers hear that their plans aren’t going to work out. 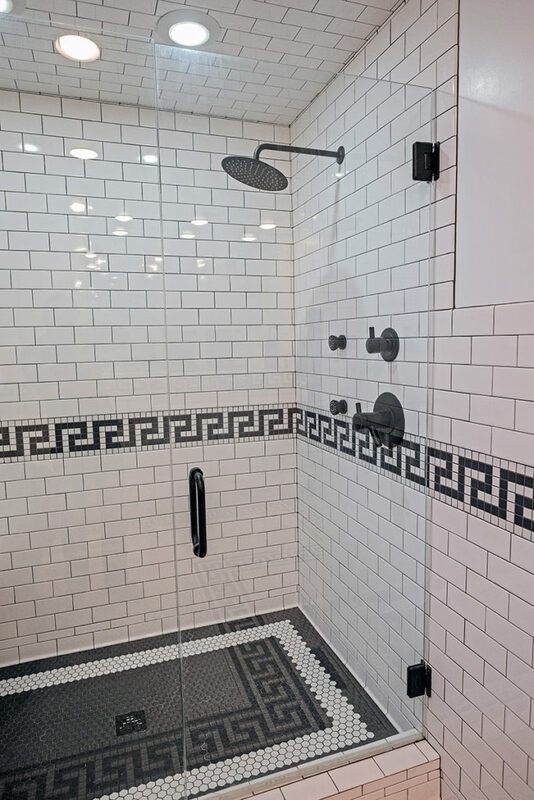 Modifications are always necessary, and Susan is very grateful that Dan is “the great craftsman that he is, and that Brett has the patience that he does.” Sometimes when one tears into a wall to remove a shower, they realize that there has been a leak for a number of years. The entire inside may have disintegrated and you must rebuild. Well, good thing Susan had Brett and Dan on the case. They worked together to take down an entire wall and start over. Susan says that the collaboration between all three parties was there from the start, which was such a joy for her to work within. From the beginning Dan felt very welcome in Brett and Attea’s home, and that extended throughout the long remodeling process. Dan can’t express enough how welcome and appreciated he felt. Brett was so kind and patient, which made the 9 months seem like 2. The large scope of this project could have been very daunting to some builders, but Dan said that Brett’s keen eye and attention to detail was a giant help. The collaboration between the three is not something you see every day, and Dan’s excitement is evident when he says that “the project was fun right down to the very end. 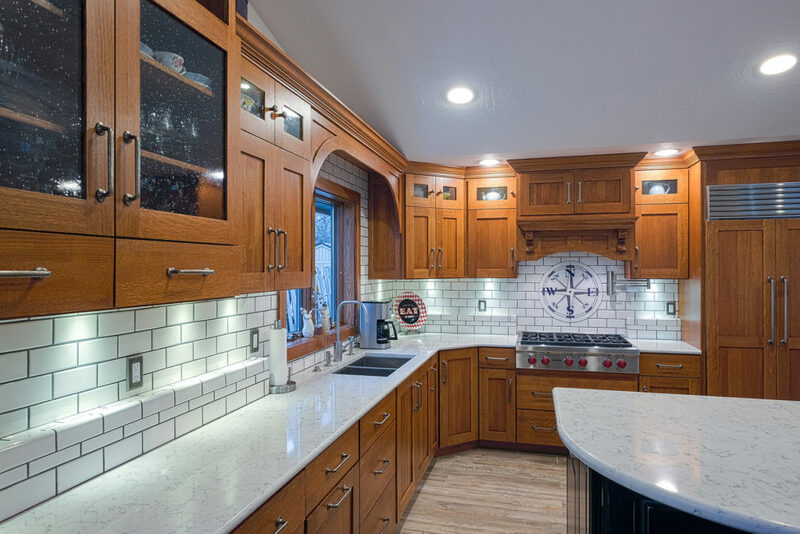 Everything has great continuity and wonderful ambiance throughout Brett’s home.” Brett, Susan, and Dan all had a blast working together and have built a nice relationship that will no doubt grow as the years go by. 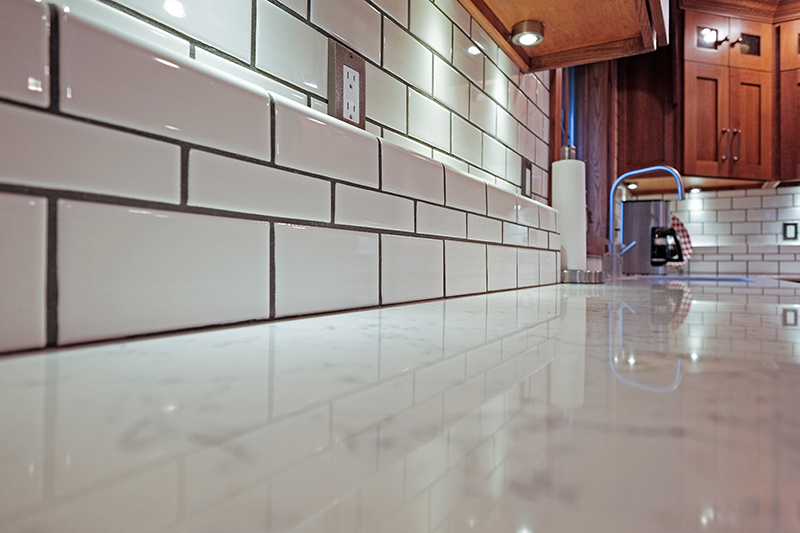 “We want that kitchen” was Brett and Attea’s thought when they first visited the Williams Studio. 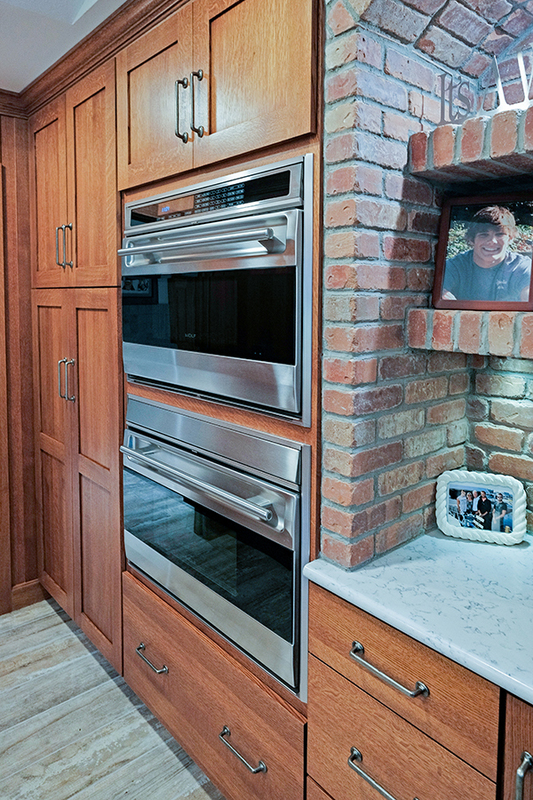 What they wanted was the highest custom line that Williams offers — gorgeous Omega Cabinetry. Omega offers customization on every product they offer, and this remodel made good use of that incentive. Everything was custom, which surprisingly only led to an extra month of work. Painted Woodland Cabinets were also used in some spaces. 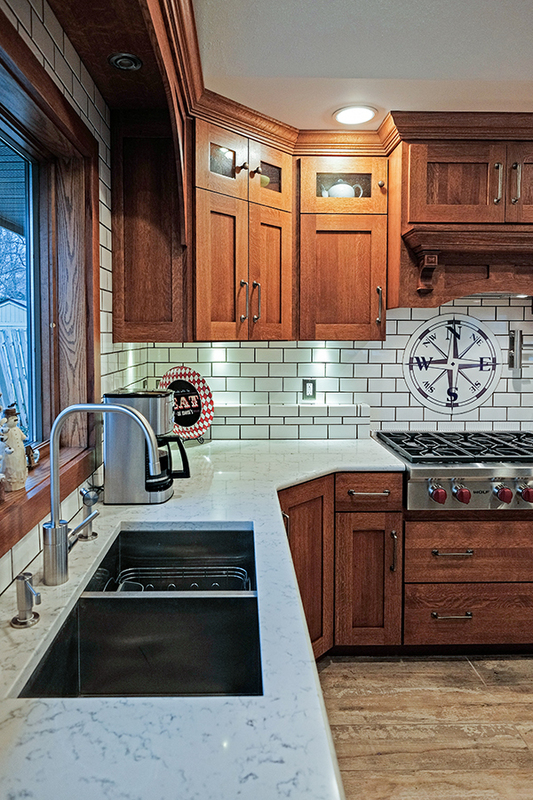 Woodland offers distressing of their painted cabinets, plus they had the correct color palette for Brett and Attea. Between Omega and Woodland, they had their choice of anything they wanted. Susan says the kitchen is a nice size, but not enormous. Some kitchens go on and on, but not Brett’s kitchen. In some respects it gives the best of both worlds. 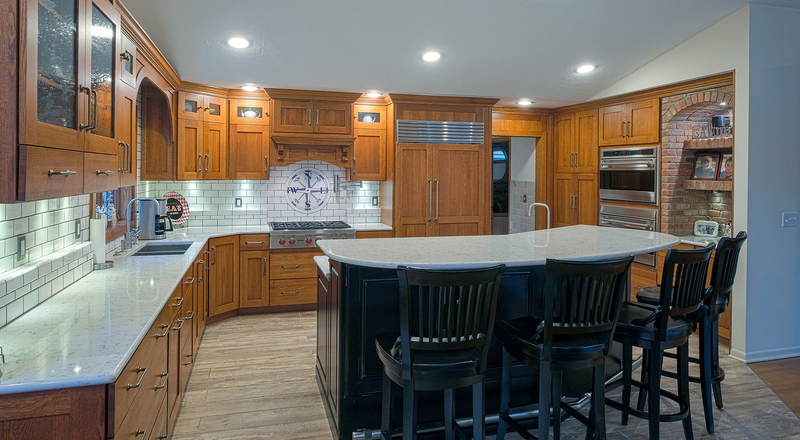 It feels and operates like a large kitchen, with big appliances, but also lends itself to entertaining. 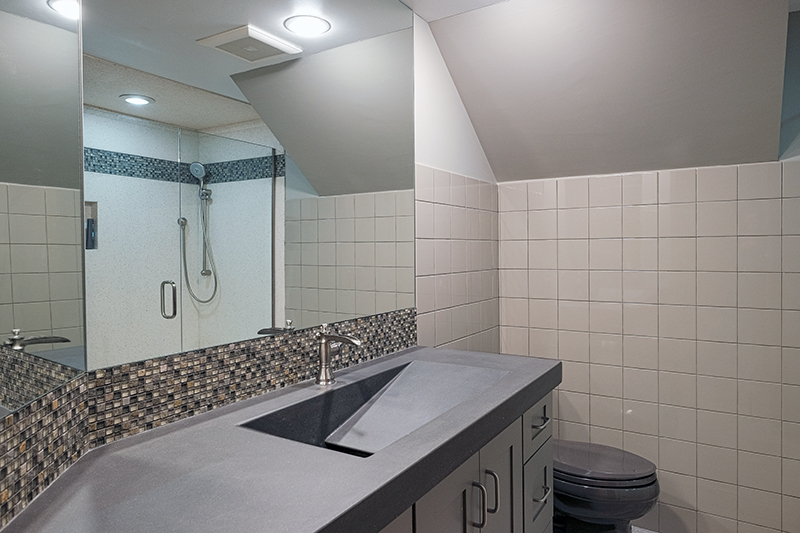 The countertops are Silestone quartz with the exception of the lower-level bath, which was done with a custom concrete countertop. 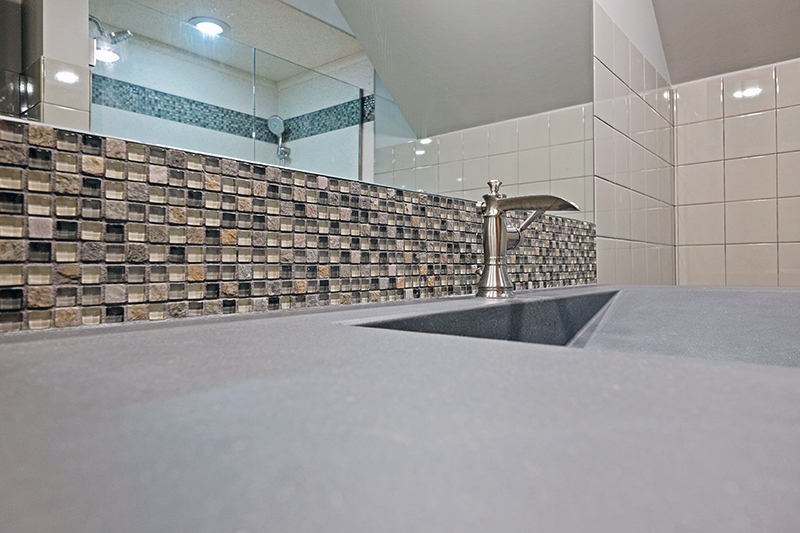 The concrete countertop has a great integrated sink, which was designed by Brett. 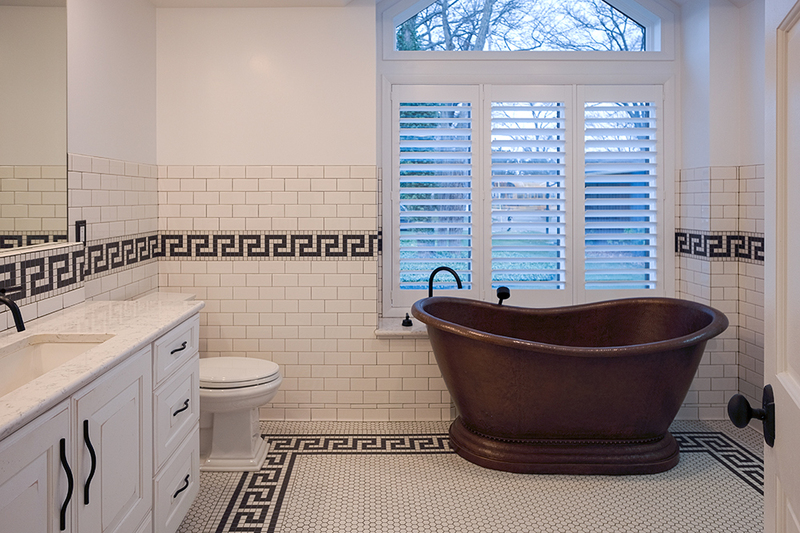 The plumbing contained some custom finishes including matte, black faucets in the master bathroom. 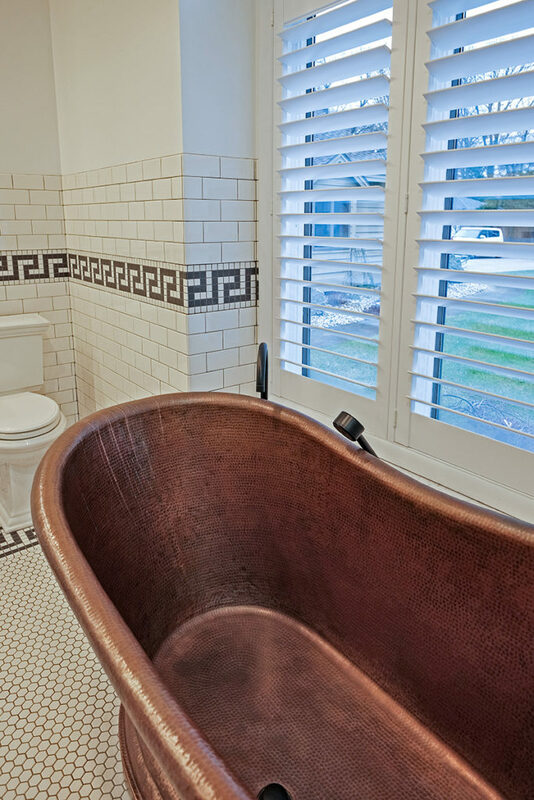 The copper bathtub in that same bathroom tied in well with the copper sink in the half-bath, allowing the pairing of contemporary lines with old world materials. A match made in design heaven. 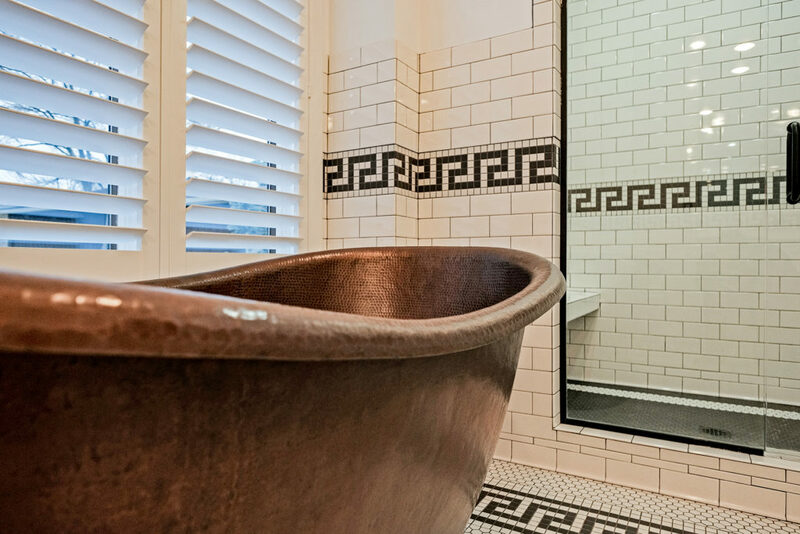 Susan says that the “juxtaposition with the bold lines combined with the old, hammered copper is just beautiful”. 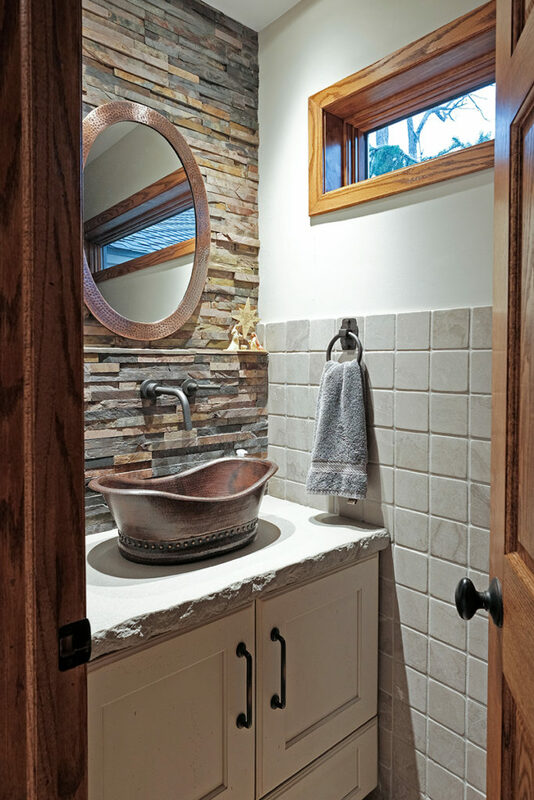 Something you don’t see very often, again a vision of Brett, is the large, troff style sink in the master bathroom. It’s an under-mount that has two faucets going into it. A very cool and unique idea that utilizes the space while creating some storage options. 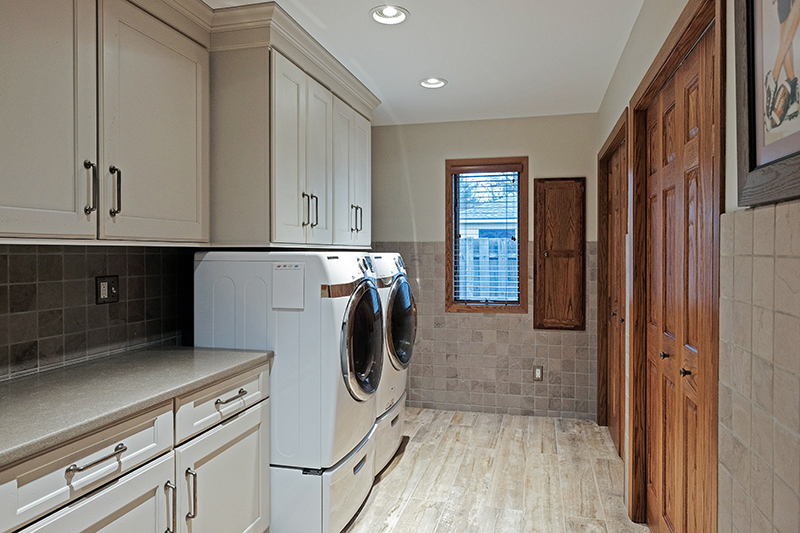 For Brett, Attea, Dan, and Susan, this home and remodel was a true team project. Everyone put their best foot forward and treated this home as it was their own. Brett and Attea had a vision. They needed Susan’s design skills and years of knowledge to pull it off. Susan knew what it would take to create a home that Brett and Attea could spend their entire life, and enlisted the help of Dan to make it a reality. Even while photographing and conducting the interviews for this story, I could tell that the three are more than colleagues. They sat in the living room like they were family, talked, laughed, and remembered the 9 short months they spent together.